Racing across northern and western Africa is not a typical destination for a newlywed couple. Nor is a philanthropic donation of two motorcycle ambulances a common activity during a honeymoon. Yet for David and Juli Kramer, this seemed like just the adventure to inaugurate their first trip as a married couple. Inspired by their love to travel, but also their desire to do something beyond the usual, self-indulgent honeymoon, the Kramers opted to research a way in which they could create an opportunity for children to thrive and have the adventure of a lifetime. Committed to the idea of participating in a global race called the Budapest to Bamako Rally, the Kramers also wanted to ensure their honeymoon had an altruistic goal. They began to research organizations that could assist them in this endeavor and connect them to a community who could benefit from their ambitious intent. This research connected the Kramers to African Sky, a non-profit organization in Mali (the race’s final destination), and whose work they admired. Representatives from African Sky, after hearing of their interests, put them in contact with their partner organization COFESFA, who could make use of their generous donation. With their plan set, David and Juli began to prepare for the logistical challenge of what they were aiming to accomplish. 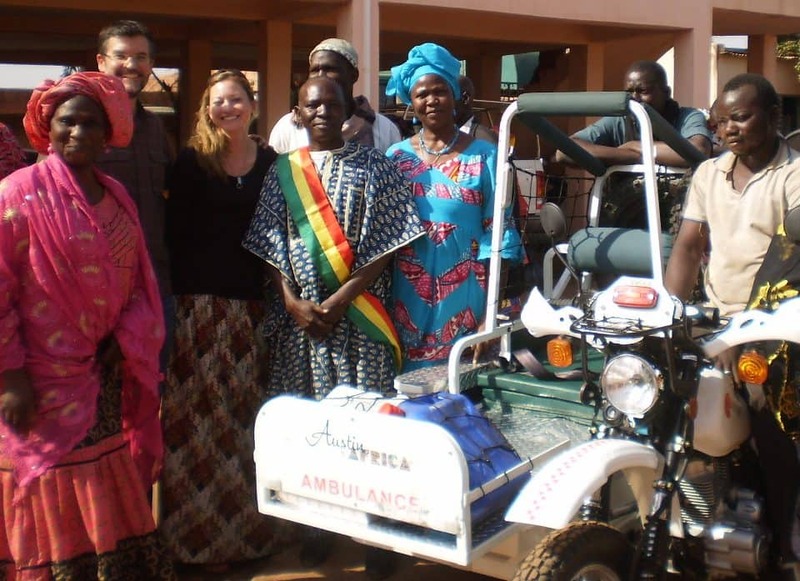 Through their planning with African Sky, the Kramers determined that an ambulance would be the most beneficial donation to the Malian partner communities. Originally, they had hoped to donate a full size ambulance. But after further investigation, they realized they could donate two eRanger motorcycle ambulances, a vehicle that would be much more functional for the Malian terrain. Next, David and Juli had to find a solution to the most important question: how to get two motorcycle ambulances into Mali? Their answer: to drive them from London, where they could be shipped, to Mali. The only problem was that Juli did not know how to drive a motorcycle. Despite this, they remained committed to their plan and began their diligent preparations, including motorcycle lessons. This plan was encouraged and supported by their family and friends, some of whom gifted additional financial support in lieu of wedding gifts. For David and Juli, this honeymoon was going to happen. “We were never alone,” he said. “There were always people to help.” This giving spirit was the theme of the trip, and one that would be reciprocated as they arrived in Mali and donated the two bikes. One went to Village Ventures, an organization affiliated with the race, and the other to COFESFA whom they had been connected to via African Sky. COFESFA’s work was especially important as the village leaders and elders expressed how much the motorcycle ambulance would help women in childbirth, bringing back into focus the original intention of the Kramers to give to a cause that helps children.